At the dawn of civilization, take control of the destiny of an entire people! In front of you are the Peloponnesus Plains. In the distance, the bright shores of the mythical Atlantis. But to make your place in this promised land sustainable, you will have to fight your opponents, develop technologies, build wonders, and above all pray for the mercy of the gods who scrutinize all your actions from their home in Olympos. 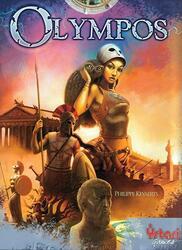 The players embody peoples who are trying to colonize Greece and its surroundings, including the mythical Atlantis. By appropriating territories and resources (sometimes by force), they will gain access to scientific discoveries and architectural wonders that will enable them to build a prosperous and glorious civilization. At the end of the game, the most prestigious civilization wins.